Can one mic deliver that Beatles sound? Chandler Limited and Abbey Road Studios have teamed up to release the REDD microphone, which is the first EMI-stamped mic in over 50 years. The large diaphragm tube condenser microphone uses the same circuitry found in the EMI REDD.47 preamplifier, to encapsulate that Beatles sound (this was the mic preamp used by the band between 1964 and 1968). 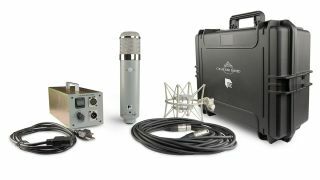 The REDD microphone is available now at a modest SRP of £4399. For more information on this and other products, head over to the Abbey Road website.